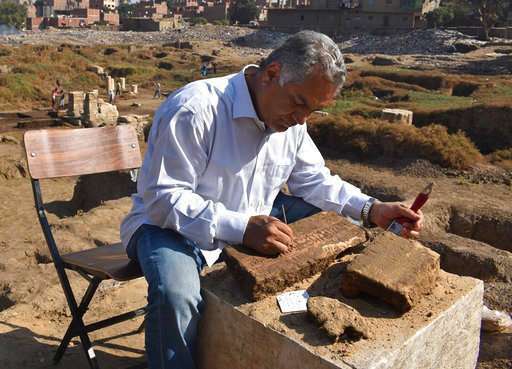 Egypt says archaeologists digging in Cairo have found two blocks of limestone with inscriptions belonging to an engineer who worked for Ramses II, one of the longest ruling pharaohs in antiquity. The Antiquities Ministry said on Wednesday that the artifacts were found in the Temple of Ra, the ancient Egyptian god of the sun, in Cairo's Matariya neighborhood. Egyptologist Mamdouh el-Damaty says the inscriptions show that the engineer had supervised the building of a booth with a seat used by Ramses II during celebrations and public gatherings. Ramses II ruled for more than 60 years, from roughly 1279-1213 B.C. Egypt frequently announces archaeological discoveries, hoping to spur interest in its ancient treasures and revive tourism, which was hit hard by political turmoil following the 2011 uprising. Was the name Sadat Engineering Consulting Inc.?